Decoder glasses and business card case. esthetica designs have officially launched the "take a closer look" self promotional campaign. The campaign was created to help promote my designs while searching for internship possibilities to complete my Bachelor's degree. 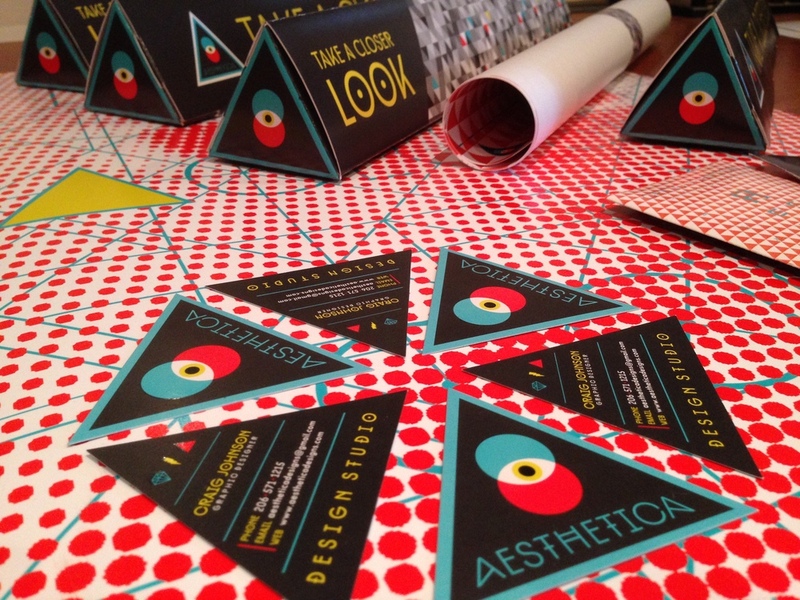 The campaign consists of Triangular die-cut business cards, decoder glasses with case, self-promotional poster along with a triangular poster box. I have created five screen-printed posters in honor of Modern Dog's refreshing and creative design studio. The idea behind the design is to network with Modern Dog to obtain a ten week internship possibility for my Bachelor's degree in graphic design. I will be hand delivering my self promotional campaign and hand screen-printed poster this week, lets make it happen! Wine case painting " when in Rome"
After my recent travels in the Roman empire and a abundant amount of wine, I was motivated to create this drawing. I found a fantastic wooden wine box for my canvas and painting. I will be designing three custom wine labels in correlation with the painting. The final product will be posted shortly this week. Stay tuned!